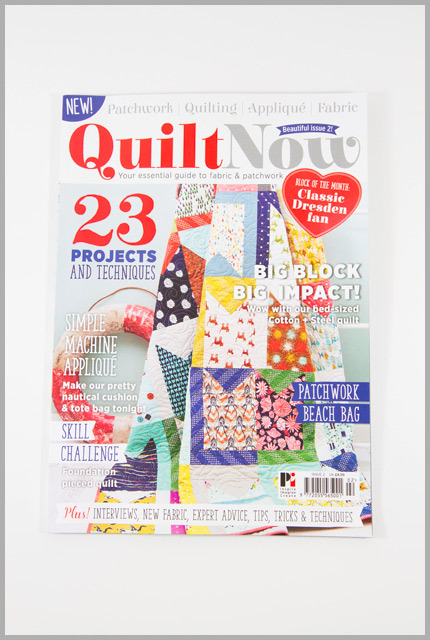 The latest issue of Quilt Now was stuffed through my door this morning (and I do mean stuffed, the regular postie’s on holiday and the guy that’s covering is, well, challenged in the delivery department). This is the new magazine being edited by Katy Jones of I’m A Ginger Monkey fame, and a few months ago a number of us were asked to contribute something to one of the first 3 issues, which had a variety of themes. I went for issue 2, the Nautical one, and embraced my inner sailor/beach bum. I hope you enjoy the issue, there are so many fabulous projects in there it will easily keep you going until next month’s comes out! Congrats, the bag looks wonderful!!! 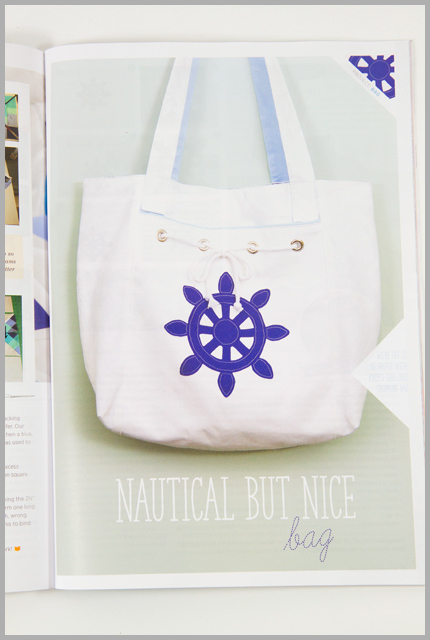 Looking forward to getting my issue so I can get a closer look and have a go at making my own Nautical but Nice bag. Very cool! That is – both the feature and the bag! You're pretty cool too and that just about covers everything. What a great bag! Congratulations!!! I got my mag today, it looks fab and your bag jumps off the page! Nicely done, missus. 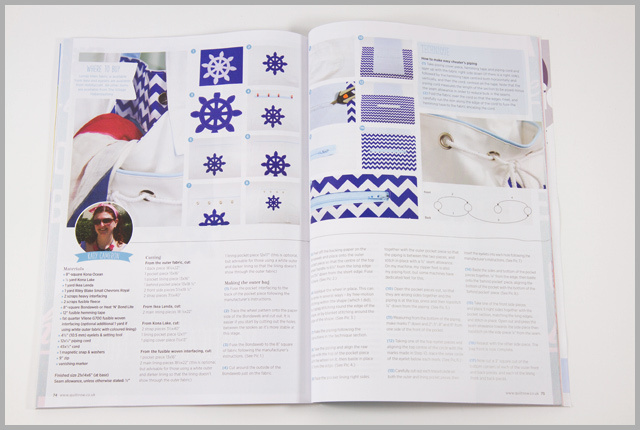 Whooo Hooo – your designs are in a magazine. And that one is fabulous ! Congrats Katy – love this bag!! Another bank holiday, another delayed mag delivery! Prob a good job as my post hols ironing would never get tone this weekend if I had the magazine in hand! Your bag looks so fresh and clean, love the different techniques you are incorporating. well done, hadn't seen this mag, another one to hunt out! Looking forward to receiving issue 2. Your bag looks fun! Love your bag Katy especially the rope/eyelet bit – great design! Congratulations! What a fun design! I like the rope detail the best. How lovely to see your bag in a magazine! Congratulations on a lovely publication. The bag is great looking. Love the bag, I'll have to look for the magazine! Congrats! It's a great bag! This magazine looks awesome! Congrats on being published in it. Your bag is really cute!